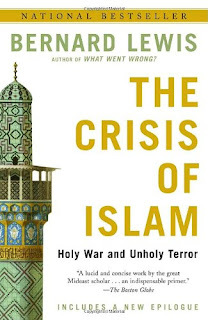 Probably realizing that his previous book on the topic, What Went Wrong?, was a spectacularly poor effort, Bernard Lewis returns a year later with a much better, but still flawed, examination of the troubles afflicting the Islamic world. But if one compares the record of American policy in the Middle East with that of other regions, one is struck not by its failure but by its success. There is, after all, no Vietnam in the Middle East, no Cuba, or Nicaragua or El Salvador, not even an Angola. This American-centric view of the Middle East severely diminishes Lewis' credentials, and is effectively saying that because America has not lost as many soldiers in the Middle East as it did in Vietnam, and because it has avoided direct embarrassment similar to the Bay of Pigs in Cuba and the financing of the Nicaraguan Contras, then the Middle East can be termed a foreign policy success. Never mind the millions of non-Americans slaughtered in meat-grinder modern-history conflicts in Algeria, Lebanon, Yemen, the Iran-Iraq war, three major Israel-Arab wars in 1967, 1973, and 1982, the first Gulf War, and both Iraq and Syria slaughtering their own citizens en-mass, all under America's watch as sole or joint superpower. Quite the record of success. But The Crisis Of Islam does contain good elements, and is generally cohesive. Lewis does a fine job summarizing the history of Islam and the differences between Islam and Christianity on matters of politics and national identity. He describes the origins and meanings of Jihad and provides a good overview of 20th century events and the reasons behind them, including the emergence of the fundamentalist Wahhabi sect, the Muslim Brotherhood, the rage against local national rulers, and the ill-fated alliances with the USSR. The variety of external and internal factors conspire to advance a precipitous decline in the standard of living of the Middle Eastern Islamic states, and in a chapter entitled A Failure Of Modernity, Lewis offers a damning statistical summary of just how far behind the Middle East has fallen in terms of numerous economic indicators. And it's a small step from the despair and humiliation of backwardness to the embrace of violence as an ultimate solution to reverse a seemingly incessant decline. While there are many better books on the challenges facing the modern Middle East, The Crisis Of Islam is a useful, but not stellar, contribution. Subtitled "Holy War and Unholy Terror". 164 pages plus Notes and Index. Published in hardcover by The Modern Library.